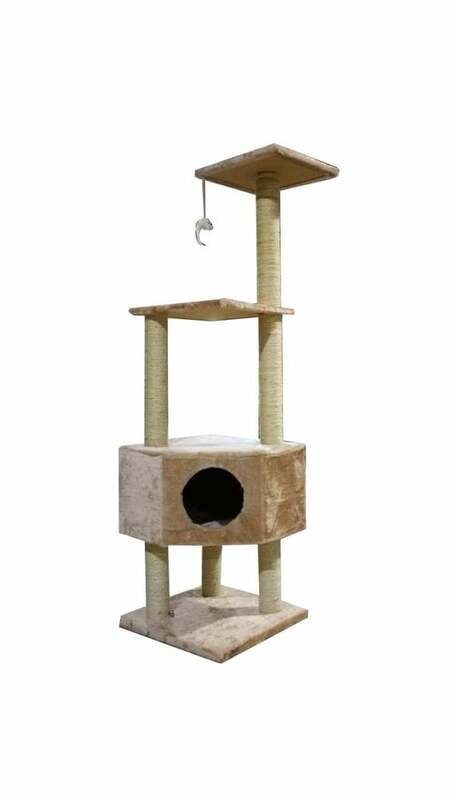 This multiple-tier cat home features multiple platforms and hiding spaces that give your cats hours of entertainment and helps support positive scratching behaviour. Surprise your cat with a new environment in which to play. Cats will be delighted exploring the openings, stairs and shelters for hours, relieving boredom while you are at work. Spacious enough for multiple cats to explore. Overall Size : 18W x 18L x 54H. Base Board Size : 16W x 16L. Top Perch Size : 14W x 14L. Size of House : 6W x 16L x 9.5H. Pressed Wood, natural sisal rope.